The Italian election on March 4 saw the biggest political shake-up in over 20 years. The two dominant establishment parties, the Democratic Party (PD) of Matteo Renzi and Forza Italia (FI) of Silvio Berlusconi, suffered humiliating defeats while anti-establishment parties got over 50% of the votes. There is fully justified anger at the Italian political establishment. But, without a mass organized working-class force, this anger has been channeled into reactionary populist forces. The PD has been in power in Italy since 2013. Although the PD traces its roots to the Italian Communist Party, it has long since embraced neoliberalism and austerity. The PD’s time in power has been centered around labor “reforms” making it easier to fire people and pension “reforms” forcing people to retire later. Italy was hit particularly hard by the financial crisis of 2007-2008 and the PD worked to revive the economy on the backs of the working class. In other countries affected by the economic crisis, like Greece, Spain, and Portugal, anti-establishment anger led to the massive growth of new left formations. But in Italy, a vacuum existed on the left that was filled by a comedian. The comedian in question is Beppe Grillo. His comedy was known for attacks on the corrupt political establishment and concern for the environment, but he had no real political program beyond that. In 2009 he launched the Five Star Movement (M5S) which has seen unexpected electoral success. 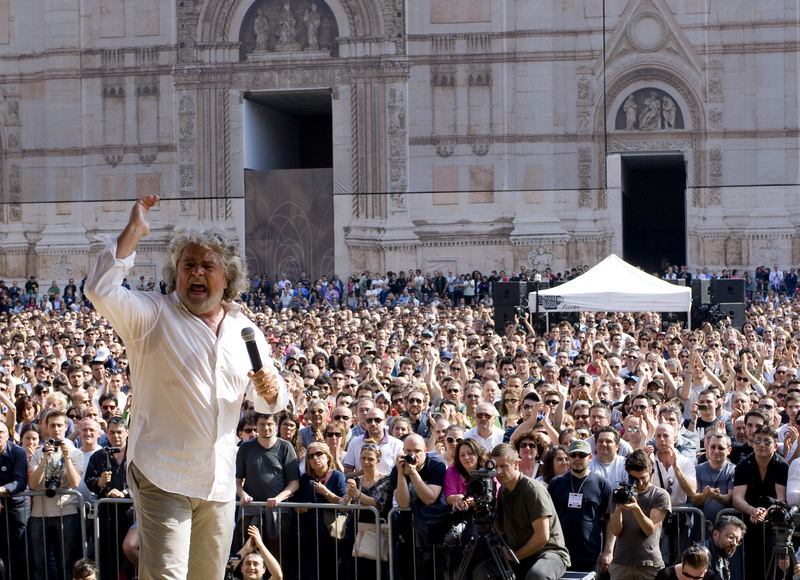 In place of a clear program, Grillo put forward the idea of “internet democracy” where online polls would substitute for internal party democracy. With an amorphous political program and a decisive denunciation of the corrupt political establishment, M5S has been able to ascend from a literal joke to the biggest party in Italian politics. But being the biggest party in Italian politics will put M5S’s anti-establishment credentials to the test. Without an absolute majority, the party will have to form a coalition government with an establishment party, or with the far right, in order to form a government. The current party leader Luigi di Maio, has been consciously rebranding the party as safe for business, backing off its opposition to the EU and its support for progressive taxation. But it has maintained its reactionary anti-immigrant populism. The other party to make gains out of the anti-establishment mood is the Lega Nord, lead by Matteo Salvini. The Lega Nord is a far-right, anti-immigrant party, originally based on calling for northern Italy to secede from the Italian republic. The entire election saw a whipping up of anti-immigrant hysteria, not only by M5S and Lega Nord, but by the establishment parties as well. This has spilled out beyond the election itself, with the shooting of six immigrants by a right-wing terrorist during the campaign. The rise of reactionary populists and right-wing, anti-immigrant sentiments is the result of the lack of a mass organized left force to tap into the anti-establishment mood. Fortunately, the first tentative steps towards building such a force have been seen in the Potere al Popolo coalition. Formed a few weeks before the election, it was only able to win just over 1% of the vote, and was unable to win parliamentary representation. But it has held meetings in across the country attracting thousands of people, especially youth, and is poised to grow. Regardless of what sort of government forms in the wake of the election, it will be a government of crisis. In the course of this crisis the building of an anti-capitalist alternative through struggle is more vital than ever.